A customer reached for avocados inside Mello’s Supermarket in Lawrence. LAWRENCE — Bodegas are an integral part of Latino community life in this racially and culturally diverse city of more than 80,200. There are at least 85 such sundry shops in an area spanning just a little more than 7.4 square miles. But while Lawrence’s bodegas offer a wide variety of food from South and Central America, fresh fruits and vegetables have long been absent from local shelves. 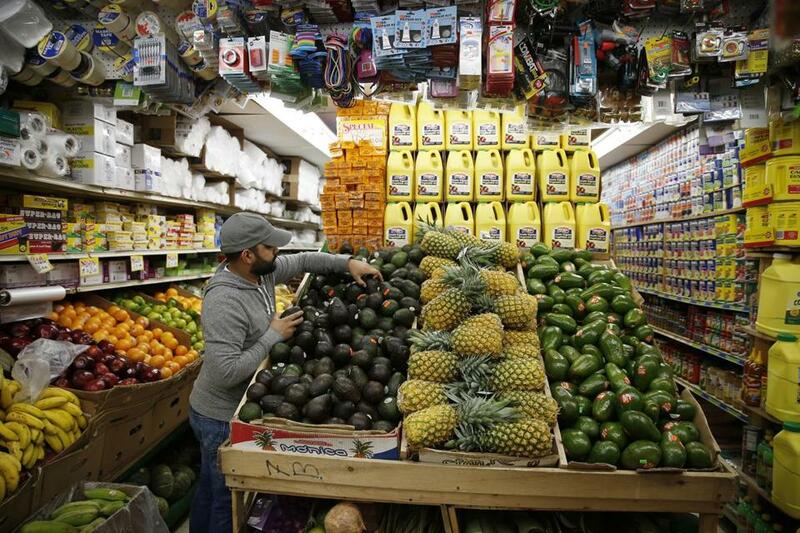 Because of their small size, many bodegas don’t have the means to buy or store fresh produce. As a result, many of the city’s poor who don’t have a car to reach the few supermarkets that are on the edge of the city suffer from a dearth of healthy food options. More than 45 percent of children in the Lawrence school district were overweight or obese, according to a 2010 report by the state Department of Public Health, likely from unhealthy or unbalanced diets. To combat the problem, Lawrence General Hospital and the city started a program called Healthy on the Block/Bodegas Saludables. With Lawrence General providing funding, the city, led by the Mayor’s Health Task Force, targeted the neighborhood convenience store as the place to make the biggest impact. Two other partners, Groundwork Lawrence and Mill Cities Community Investments, identified possible improvements to participating bodegas and provided consulting assistance for shopkeepers. “If you want to impact obesity and people’s health around the issue of food, you have do it where people go shopping, and that’s bodegas,” Mayor Daniel Rivera said. The corner shops provide the city’s large Hispanic population with more than just food and essentials. They create community and remind many of the world they left behind. The program started with just a few participants in 2015, but now more than two dozen bodegas provide some selection of fresh produce. In addition to refrigeration, funding is being used to properly display and label the produce to make it appealing to customers. And customers are noticing. In many of the bodegas, the fruits and vegetables greet shoppers at the front of the store. At El Mello Supermarket on Park Street, cartons containing bananas, avocados, grapes, melons, and pineapples line the narrow walkways. “It’s more fresh, it’s good for my family,” said 39-year-old Dinia Orias, as she walked out of El Mello on Monday with lettuce, tomatoes, and lemons. Ramon Estevez, a pizza delivery worker, said he comes to El Mello every day for fresh mangos. El Mello’s owner, Cesar Checo, immigrated from the Dominican Republic and set up the shop 10 years ago with his brothers Lionel and Juan. His bodega is now one of the busiest in Lawrence, supplying everything from the fresh produce to household goods. City officials, including Rivera, recognized El Mello’s participation in the Healthy on the Block/Bodegas Saludables program and awarded Checo a certificate last month during a ceremony at the store. Checo said customers have driven from as far away as Canada to buy food from his shop. El Mello is now a much bigger operation than the typical bodega. Checo said he has 18 employees and has built a warehouse down the block to store and distribute large quantities of food to other bodegas in the area. He said the sense of community among bodegas is so strong that other shopkeepers will recommend El Mello to their customers if they don’t carry a certain product. Lawrence General Hospital said some $225,000 has been allocated to the Healthy on the Block initiative over a six-year period. Overall, the hospital will spend nearly $2.5 million on health initiatives in Lawrence as part of its Surgical Building Construction Determination of Need program. “We’re all about taking care of patients beyond the walls of the hospital and taking care of the needs of all of our communities,” said Lawrence General president Dianne Anderson. Ultimately, city officials said they hope healthier food options will lead to a decrease in obesity.